Picture by Geothermal ERA Network. In the behind of the tourist paradise of Bláa Lonid you can see a large Geothermal Power Plant. The manmade lake resort is heated by cooling water that is discharged. I used the term “fracking” to provoke reactions out of anyone who read this article. What I am really talking about is drilling into a volcanic system to inject water so that you get steam to drive a power plant. Or in other terms, your garden variety geothermal plant, such as those Iceland is filled with. Some years ago I had the honor of leading an evaluation project for such a plant. That project was later scrapped for various reasons. What I learnt during that time has made me dither on if geothermal energy production is a good idea or not. A short while ago I got my interest back in geothermal energy and I now have the option of becoming involved in such a project again. This made me start to pick over what I know to decide if it is a good idea, and if it is something I would like to become involved in again. And, for me there is no better way to come to grips with things than to write it down. Disclaimer: I am generally in favor of geothermal energy and I have a vested interest in its future, you be the judge if I represent things correctly. One thing is for sure, I will strive to give the issue as unbiased representation as possible. I will go through the benefits, the dangers involved, the technology itself and finish with the place I find to be the most suitable to construct large scale geothermal power plants in. Nesjavellir Geothermal Power Plant in Iceland. WikiMedia Commons. To build a geothermal power plant you need two things, one is a dormant or active volcanic system that has places where there is readily available hot areas close to the surface. This is often, but not always, evident as hotsprings or fumaroles happily steaming. The simplest way to harvest free geothermal energy is to diverge a hotspring to heat houses, or to cap a fumarole to catch the steam for heating. This has been done for hundreds, if not thousands of years. But if you wish to build a larger geothermal power plant you need ready access to clean water in large amounts. Otherwise you will not have the necessary water to inject into the wells that you have drilled. Among the industrialized countries the US has a little bit of Geothermal Power Plants, but could really do a lot more of it. Fracking the living daylights out of Yellowstone could create enough electricity to drive half of the US. It is though not advisable, not because of any dangers, instead it would be a stupid idea since it would destroy the cultural and geological idea of the national park. Instead there are other much better places to do it at. Italy does it, but they could do a lot more of it. Campi Flegrei and Vesuvius would be good options to increase the energy harvest out of. Japan is good at using the potential for geothermal plants, but could also increase the harvest several times around. The bright and shining star of geothermal energy is Iceland. Due to the numerous hydrothermal and geothermal power plants on this island nation it is self sufficient on energy without any hydrocarbon sources, and it has the lowest electricity price on the planet not caused by state subsidies. The Icelanders have done it for decades and are by far technology leaders in the field, and have done this by drilling into active volcanic systems without causing any dangerous accidents. Energy is the most powerful and essential commodity known to mankind. Readily available energy sources have transformed many developing countries into prospering countries, or even super rich countries like Saudi Arabia. So far these energy revolutions have been based on hydrocarbons like oil or coal. These are finite sources that will dwindle returning these countries back into poverty unless the monetary gain has been reinvested wisely. Norway when it found oil was almost dirt poor, but it has collected its oil income into a massive oil fund to safeguard the future. Saudi Arabia on the other hand uses it to support things that should never have been supported (let us leave the politics at that), and will have almost nothing as the oil run out. Then we have the problem with hydrocarbons causing a lot of pollution and being the premier source of climate change. Geothermal energy on the other hand is almost limitless and will not dwindle in the foreseeable geologic future. It is also the cleanest of all known means to produce energy (I will get back to this). 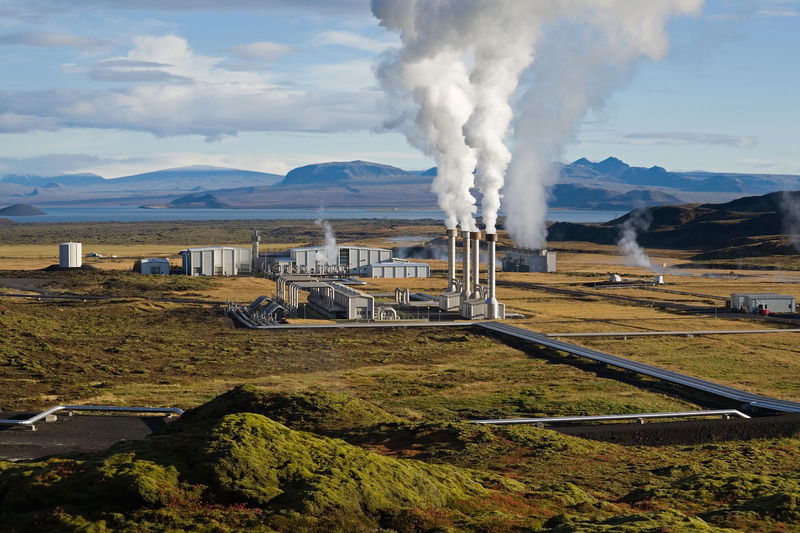 To put geothermal energy reserves into perspective it suffices to say that the possible gainable energy is several times larger than the known hydrocarbon energy reserves. Most of it is to be found in generally poor areas and countries like the Central Americas, The Andean mountain chain, The Philippines and Malaysia. In these areas and countries comparatively little or no geothermal energy is harvested today. Building a geothermal power plant is cheap when compared to oil, coal, nuclear, solar or wind power energy plants. And the cost of the “fuel” itself is totally free of charge. As such it is a good commodity to invest money into production. Most developing countries are plagued with high energy prices and unstable electricity production. This severely hinders industrial development and scares off foreign investments. Increasing electricity production to lower the prices would induce increased investments into industry and lead to increased prosperity, while at the same time it would lower the cost of electricity for the general population. It would also give the geothermaly rich countries the ability to export electricity to neighboring countries at competitive prices. Electricity does though have a distinct drawback to hydrocarbons, it does not readily store well and it is almost impossible to export over larger distances. But, currently there is a drive towards utilizing hydrogen as a fuel for cars. And a country that has almost limitless cheap electricity can produce hydrogen through electrolytic conversion and export hydrogen to the industrialized energy starved areas like Europe, The US, and China. Me doing the very hard work of researching a suitable location for a Geothermal Power Plant. 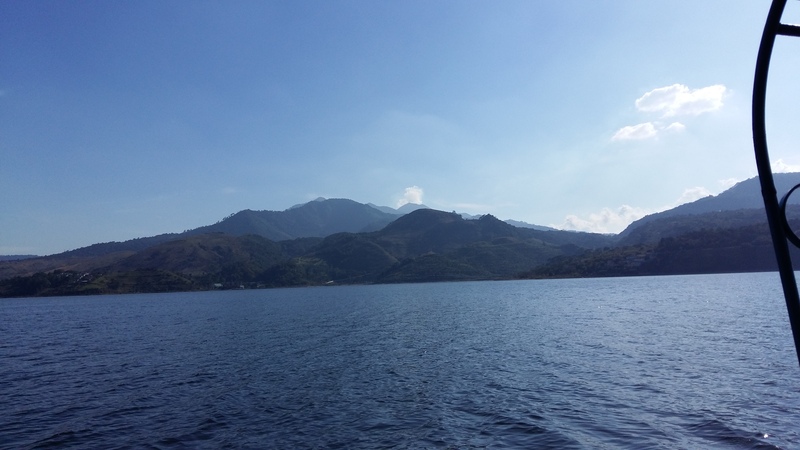 Lake Amatitlán with Pacaya gently erupting in the background. Since most developing countries lack the know-how and expertise to build and maintain these power plants they suffer the risk that it will be the large power companies of the world that will build these power plants. In my opinion it would be far more advisable if the developing countries owned the rights and leased them out to companies that have the know-how and expertise. And surprisingly enough the giants in the field are the Icelandic power companies together with their crafty oil cousins in Norway and these companies are willing to perform cooperation projects together with local authorities and land owners. There is also an ever increasing will from agencies like the International Monetary Fund, SIDA and other development agencies to help fund projects like this. The main problem with geothermal energy in the developing world is the lack of knowledge locally and the lack of readily available information on the subject. In the next part I will get back to the dangers of geothermal energy extraction, both real and those perceived by the general audience due to lack of information. Good way to kill a drill bit, but if the magma doesn’t want to come out, poking a hole in it won’t really help any. Great topic, Carl. Cannot wait until the “To Be Continued” continues. Atitlán but were not aware of Amatitlán. Incredibly beautiful country. Trying again, error on last post attempt. … yeah, like you could “just imagine” you vapid screen reader. Man how I hate the “news”. Honestly, this really pisses me off. Not trying to be haughty or anything, but the audacity of that wet behind the ears punk to try and express some level of awe to me with his mindless punk banter. I’ve been in heavy seas, I friken know. Others of you know exactly what I’m talking about. I felt insulted by this “news” punk. Perhaps you could enlighten us to whom and what you refer? News twit on local TV. Like most news twits, he is without clue, and was trying to express the gravity of the situation just off shore. Being limited in vocabulary, he reverted to wannabe valley girl speak with the term “ya know” in his news report. He is probably a minion of Vodka Bob, an older reporter from the same station who had a run in with FHP and a DUI charge… after sitting at his news desk for years reporting with disdain on people who had consumed alcohol and gotten into trouble his news casts. Yeah, there are 12 foot seas and Gale force winds out in the Gulf of Mexico, but if you are that far out, you had better be in something more substantial than a fishing charter. Essentially, it’s the back side and trailing end of a forming Nor’easter. The one the national news twits are falling all over them selves about right now. The only thing we need now is for Jim Cantore to wander on screen in Hip Waders and a Parka and say “Look at da snow!” At least he is not as bad as Geraldo Rivera who was spotted by an acquaintance of mine dragging fallen branches around trying to make an exciting looking set piece for his report during one of our Hurricane events. If Geraldo had waited a few hours, he could have used the car in the parking lot of the Civic Center that got nailed by an air conditioning unit off the roof. California and we were working a fire that was ah, problematical. All of us were tired and not wanting some News type to waste our time. Newsie: “Are you with this airplane sir.? The Newsie left-no film at 11 either …. BTW Ornbaum didn’t do abbreviations…. I think you’re misconstruing people that work for a living, vs the self centered know everything @#$@ bags that are just trying to wing it because their mean editor sent them out for a story. I mean, the gall of some ancient typewriter monkey to tell them what to do or that they don’t have enough words in their article. a tree due to a malfunctioning ‘chute hard), Smokejumper. He knew the Aerial and Ground game that wildfire fighters do. But he wasn’t “Pretty” so he was behind the camera. Love to comment on the volcano-fracking post, but I’ll wait for part 2. Great topic, Carl. I/We have local interest as two major geothermal plants have been built near us, one within a stone’s throw of the Salton Butte volcano (in the US) and one adjacent to Cerro Pietro volcano on the Mexican side of the border. To their credit, they have solved a challenging salinity problem to get them productive. And they have really produced, solving a large energy shortage in Baja California. I believe GeoLurking mentioned he had done some geological work on the US side. The danger, as I understand, is that these volcanoes sit on significant spreading rifts. One of the few places in the world, other than Iceland, where the mid-ocean rift comes on land. North of this region the major faults converge onto the San Andreas fault. The good news, it seems to me, is that there doesn’t seem to be a hot spot. the bad news is that since the plant was built, there was a M7.2 very close to the Mexican site and their response seemed to be, to the concerned employees, “if there’s a large crack in your room, move your desk.” Furthermore, there seems to be only one GPS site there and very little science going on at the Cerro Prieto volcano. And, by the way, there’s nearly a million people living within 30km or so. Given the science available today, I would think this needs to be more closely studied. … no, Geolurking has done no geological work pretty much anywhere, other than helping my dad dig out a basement, and random amateur level studying of geologic formations. Now, if ya want to talk about radars and weapons systems, I’m all ears, but can’t say much. 35 restaurants across China have been found illegally using opium as seasoning in their food, state officials say. Five restaurants are being prosecuted over the findings, whilst 30 more are under investigation, according to the China Food and Drug Administration. The eateries include a popular chain of hot pot restaurants in Beijing. It is unclear how the opium came to enter the food, however, previous cases in China have seen chefs try to ‘hook’ customers on their food through use of the narcotic which can cause serious addiction. Between hydro and geothermal, NZ electricity is currently around 75% renewables and rising – pretty damn good. Sorry Mike, New Zealand has a lot of geothermal energy plants. If I remember correctly… Iceland (well, a company in Iceland), managed to inadvertently hit a magma pocket in one of it’s drilling endeavors. About all it really managed to do was gum up a drill bit. The magma wasn’t ready to come out, so it just sat there killing the drill bit. Correct. Krafla. Rhyolite interestingly enough. Very interested in this topic, so thanks for posting, Carl. It prompted me to look up how many hot springs we have in the UK, given that we’re not exactly famed for volcanic activity hereabouts. I was surprised by how many we have…and some very close to where I live. It caused me to ponder just how hot a spring would need to be before it became a viable energy resource? The hottest springs in the country seem to be in the city of Bath, and are up to approx 45C. I’d love for the UK to increase it’s use of renewables, especially if those renewables do NOT include tidal range generation within the Severn Estuary….upon which subject I submitted a report to the UK government a few years ago…. A very bad idea in my opinion. Based on the gradient map located here, that seems a bit of an odd place for hot springs to show up. It’s located in the 50 to 60 mW/m-2 contour. Southwest of there is a much higher heatflow. That link made interesting reading, thanks GL. I suppose it makes sense that the South Western peninsula would be a more obvious place for hot springs to arise, given that granite is relatively common, and there is (I believe) a high level of naturally occuring radon gas in some parts of Cornwall. But the springs which gave the city its name were well known even back in roman times. The city was named Aquae Sulis by the Romans. The minimum economically viable temperature is 150 degrees Celsius for electricity production. The UK would be better off with importing Icelandic electricity, sadly so far the Icelandic companies have not been willing to participate in building the cable needed. The total power the Earth generates is about 40 Tera-Watt. Two thirds of this comes from radioactivity (mainly in the crust and mantle). The rest is a mix of solidification of the core (10%), slow contraction (105), slowing down of rotation (5%). The energy comes out mainly, and not surprisingly, along the mid-ocean ridges which makes it hard to tap into. Iceland is a very lucky place. The UK is not well placed. But of course, small reservoirs of heat can occur anywhere, such as in aptly named Bath, and they are a nice local resource but do not play a significant role nation-wide. The total usage in the world of electricity is about 3 TW. In principle, there is more than enough geothermal power available, but it comes out in very inconvenient locations. Most of iit goes into heating the oceans. If you are willing to treat ground heat as a non-renewable resource, more can be extracted. But soilar energy can generate a lot more. The UK could get a good fraction of its electricity from tidal energy. Of course electricity is only a minor part of our energy needs. Transport uses a lot. There have been some very interesting developments in tidal stream technology over the last 10 years. They represent a much more flexible and adaptable mode of harvesting energy from the flow of the tide, although not without issues such as transporting the energy efficiently away from a potentially mobile generation module. However, Tidal range developments get the headlines and the political impetus, largely because the companies with an interest in building them are large civil engineering concerns, who can fund research which a cynical person might say tends to lean in favour of very large fixed installations which would have to built by..oh..here’s a coincidence… Them ! Britain in general has a large tidal range, and a very good resource for tidal stream generation as well. I would be more than happy to see tidal stream tech seriously looked at, as opposed to range. It is my considered belief that in most specific locations around the UK, Tidal range generation does not represent a viable or indeed a renewable resource. Blame the phytoplankton ! There is of course the tidal range plant in France which has worked for a long time. The advantage of a range plant is that it can double up as a pumped storage facility. Energy storage is essential for any significant renewable resource. Yes , La Rance is there , and is often held up as an example of how it can work well. However, as far as a more general application is concerned, La Rance is not quite as good as it might appear. The river there flows from source to sea over some pretty insoluble rocks, and carries a very low silt load…which is atypical where hypertidal estuaries are concerned. Certainly it is nothing like any estuary in Britain with a similar range, which typically carry a very large silt load. But even so, La Rance has issues with silt, which causes moving parts to wear out much more frequently than expected, at a very significant cost. There is also an issue with the effect on species native to such estuaries. The biggest problem is that where there is a significant silt load, a 50% loss of energy in the water causes the silt-bearing capacity of that water to drop by an order of magnitude. In temperate climates this will leave the resulting silt deposits, to form, and then be exposed to the interaction between marine phytoplankton and freshwater crustaceans. They act on and in the silt in such a way as to make it , for want of a better way of saying it, very sticky and unusually persistent. In fact, it sets up a cycle of flocculation whereby the silt beds form and attract more silt at a phenomenal rate. These deposits caused a huge problem in the estuary of the Petitcodiac River in New Brunswick, Canada, where a causeway was built across the river at Moncton back in the 60s. Although the gates of the causeway were removed about 2-3 years ago, the silt has still filled in something like 90% of the width, and 75% of the previous depth of the river for a distance of about 11 miles… on the OUTSIDE of the causeway. In the interests of brevity, I will say merely that siltation is not the only issue. When will propetating dikes erupt? Yeah, but for some reason the phone preferred the other spelling. The “snow event” will provide another excuse for the economic slide of the current month. There is opportunity in every event. Why would anyone want to cut the hype? Unknown object strikes an A320… in cruise. Think it was back in the ’70s, I remember reading an accident report from over some south of the equator continent (South America or Africa) where some type of a condor, with a snake in it’s claws, impaled itself in some RAF transport at FL350 (35,000 ft). Have personally seen what a fair sized duck (unknown type) does to a DC-9 in Louisiana, had to ferry out a rush job for a section of the leading edge. The duck went through the deicer section, and smahed some hydraulic lines that were behind it in front of the spar. The hole in the leading edge could almost fit a bowling ball. The crew told me that happened below FL100, on a landing approach. Had a nice ding in #2 cowling on my old DC-7 tanker I co-piloted. Canadian Goose, at about fl 100 ..
any plane to hit-this was a twin Cessna 310.. I don’t like Pelicans. I had to wrestle with one once for 20 minutes to get my hook back. Not a happy bird, and bugger still got my bait fish. I actually relented and let him have it since he put up such a fight. I kept the leader and hook though. SOB still tried to go after my next cast. I gave up on fishing for a while, the pelicans just got to be a pain in the arse. Now the weekend boaters who think they rule the bay and putt-putt right across your lines, well, just flip the bail and let them have the spool (it freely feeds the line) and they can deal with the tangled mess on their prop. It’s much more inexpensive to reload a bail with fresh line than it is to replace a motor. For impact carters the rule of thumb is that the size of the crater is 22 times the size of the impactor. Here the dent was 20 cm, so you are looking at something 1cm across. If it was hit at cruising speed, It needed to be compressible (soft) as otherwise it would have punched through the hull. not many things come to mind. 1cm is too large to float at that altitude. The most likely origin of the impactor was the aircraft itself. Something pinged off, and hit the hull but at much less speed than the cruising speed. Did they check the windscreen wipers for damage? A small bit of ice coming off, or a frozen spider? Note: Under the premise of my Grand Unified Theory of Stupid, I tend towards the more bizarre scenarios. Sometimes, the simplest explanation is wrong, the more idiotic one, especially if it potentially involves the action or inaction of Homo Stultus, is more likely. Note: I am of the belief that Homo Sapiens (aka Thinking Man) is extinct, and has been so for quite some time. Extant hominids are best named Homo Stultus (aka Stupid Man). Florida Statute 775.087, is a law that mandates minimum sentences if a weapon is used in the commission of a Felony. It’s commonly known as the 10-20-Life law. According to the Hillsborough County Sheriff’s Office, Robert Thompson and Taurus Morris threatened a Plant City man Sunday for the eggbeater. Morris was holding a gun while Thompson held a knife to the resident’s throat. The suspects face charges of armed burglary of a dwelling and are being held in Orient Road Jail. Thompson also faces a charge of aggravated assault. The eggbeater was found in his pocket when he was arrested. Note: The eggbeater was not incidental to any other portion of the robbery, it was the only thing stolen. I imagine that they had a lot of fun describing how they wound up in State Custody to their new peer group. The Dean of Dublin, Jonathan Swift, was there before you by the small matter of 300 years or so. He concluded that mankind, the yahoos of Gulliver’s third or fourth journey (to the island of the noble Houyhnhnms), were not Homo Ratio but only ratio capax, i.e. not ‘thinking man’ but ‘man on occasion capable of rational thought’. Not claiming exclusivity to it. Just that on nearly every day, the evidence for its accuracy builds. Ecce Stultus. Now, when you get down to the nuts and bolts of it. Is not a propagating dike essentially the same as a fracking operation, but from the other end? In both cases, the fracking fluid/magma is trying to overcome the hoop stress for whatever rock strata is is in and instigate a mode 1 failure in the rock. For those who pay attention to the news (at least American news), there has been a bit of a snowstorm on the east coast. Really not a big deal, but this news story I thought was an interesting parallel to something that is not always considered to be a major hazard from large volcanic eruptions. Take the above gif – and just replace the snow with ash (rock). Compared to snow, ash typically weighs 10 times more, which causes a load of problems. First off, ash makes mobility extremely difficult. Driving in it is extremely difficult, and in many cases, not a realistic option. Similarly, sludging through extensive ashfall on foot would likely be a terrible idea for numerous reasons. So naturally, when it comes to extensive ashfall, the best option is to wait things out inside if you cant get away before the ash piles up too much. But that’s where the problem of the weight of ash comes in – most buildings are simply not built to handle the weight of 10-20 cm of ash on their roof. This causes roof collapse, which could be quite a problem when people who are trying to get out of the ashfall are inside said buildings. The above video is a clip from a documentary on Pinatubo’s eruption. People think of volcanoes, and generally assume that the pyroclastic flows are the biggest risks. They’re certainly problematic, but even the biggest flows and ignimbrites only go so far. But ashfall can extend quite far and be quite extreme even at great distance. The ash deposits of the enormous eruptions that have occurred in Japan largely blanketed almost the entire country. For example: the Akahoya ash deposit from the 6300 b.c. Kikai eruption deposited 10-20 cm of ash as far north as Northern Honshu. Obviously, areas closer to the eruption would have the biggest problems, but what about a city like Tokyo, which is quite far from the eruption location? Tokyo wouldn’t have to deal with pyroclastic flows, but has anybody considered how the city would handle a foot of ash blanketing nearly 2/3 of the country, including extremely population-dense areas like Tokyo? Keep in mind, ash doesn’t melt away, and isn’t as easy to remove as snow and ice. It also has the nasty habit of forming lahars in just about any river basin if you get enough of it. On a somewhat smaller scale, how would Mexico City handle ashfall deposits from a significant Popocatepetl eruption? Even if there is no flank collapse or extensive pyroclastic flows, how badly would even a moderate sized ashfall layer cripple a massive city like this? Then you end up with more long-term effects like the simple fact that ash would kill off crops and livestock, contaminate water sources, and irritate the lungs. Looking at it in this manner, I think you would have to consider the ashfall of a large eruption to be one of the biggest risks and hazards. Depending on wind direction you might survive even an Oruanui sized event in Wellington,it could be a post apocalyptic existence though. While not unreasonable, it assumes that someone else ventures out and takes care of the problem for you, exposing themselves to all the hazards so that you don’t have to. In the case of a large eruption, you’d probably have to choose between the evils of having to go out and expose your head to pumice and lungs to ash on the one hand and staying safely inside only to be buried alive when your roof collapses on the other. You really cannot expect others to do that for you even if that’s what we’ve been brought up to expect as “our rights” by our dear politicians. I lived though ( and flew airplanes though) the mess of St. Helens. it-then sued the City of Yakima. Well, to be fair, I was more or less trying to point out this catch-22 specifically. A lot depends on the situation obviously, but sometimes waiting things out for aid to come, or at least for the eruption to end may be a better idea than trudging through falling tephra. Keep in mind, walking requires lots of water, so I’m not sure it would be the best course of action to trek extremely slowly through a foot of ash trying to get out of it (especially if it’s a large eruption). Another issue would likely be traffic, or dealing with all the other population density trying to escape at the same time. To be fair, in the very extreme case of Japan I mentioned, the best solution would probably be leaving japan altogether. And that was an underlying sub plot for one of the Yellowstone movies. The “nugget of wisdom” that the protagonist gave was that people should walk to rescue rather than waiting for it. It was supposed to be some sort of epiphany by the way they presented it. The idea was that rescue operations would be so swamped that no one would ever come and you would just die of starvation/thirst while waiting. It’s not even close to the magnitude of these sort of events, but in my experience, things were just fine until aid organizations showed up. Granted, a Tornado or Hurricane is a bit different than an ash-fall, but in general people who are well prepared, self reliant and resilient tend to be the ones to fare the best. I agree that it is a bit of a “damned if you do, damned if you don’t” scenario. Besides, in your example a foot of ash means every square metre of roof will carry something like 0.4 tons ( 1 x 1/3 m = 1/3 m^3 with a density of 3 but tephra is 2.5 times as voluminous). For an average-sized house 8 x 12 m (25 x 40 ft), the roof would have to be able to carry a weight of ~40 tons – provided the ash was not wet! You’d have to wonder how all the information Technology and machinery in a huge city like Tokyo would handle even a light ashfall. Probably not much differently than now. I have an open call on Monday for a site complaining about an overheating printer. Oddly enough, the station in question is the same one where every previous printer has had heating issues… jammed up against the cabinet where the chassis vents are blocked. Tephra, being mostly silica, is usually not very conductive. I imagine that the greatest problem will be mass loading on structures and clogging air filters. Turbines, well, they might have an issue, but much less than an airliner’s engines since those don’t have any sort of inlet air filtration. Fixed turbines can have filtration units since they have the luxury of not having to hoist it up into the air as dead weight. In New Zealand most of the power grid and transportation links ,pass through next to Taupo and the central plateau volcanoes,as well as a significant amount of power generation,hydro and geothermal,so a large eruption that Taupo could produce would basically cut the country in half. Speaking of Popocatepetl, ash and gas for at least the last 24 hours…. Quite apart from the environmental disaster of losing Lake Nicaragua the proposed canal being build to replace the Panama Canal is being cut through a tectonically active region. Yes, indeed. The idea of making a canal through Nicaragua has been discussed for a hundred years. We were in Nicaragua when they first started talking about the most recent project. Many, many negatives for this project. Of course they try to indicate all is well, do not worry. There are plenty of active volcanoes in the area including two on Ometepe Island located in Lago Nicaragua. The lake has been formed by forces related to the volcanism. The big promoter, Wang Jing, supposedly a multi-billionaire was indicating he would invest heavily in this project. However, recently he has been reported to have lost most of his wealth in the Chinese economic slowdown. I find it hard to believe that el Norte would allow such competition to their recently upgraded Panama canal. In fact, I told my wife that a likely scenario would be for outside forces to try to instigate another revolution if the project seems to be go. The ensuing chaos would probably put a monkey wrench in the project. Anyway, loss of much of the potential funding may stop the project although it is rumored that the Chinese government may try to fund it indirectly. It is interesting to note that we ran into a group of Chinese in San Carlos at the SE end of Lago Nicaragua and the mouth of the San Juan River. I said hello to them in Chinese which startled them. They spoke some English but froze up when I asked what they were doing there. They said that they were doing research on sea life. Yeah really, they why did we see them loading a leased boat with surveying equipment? Hmmm, good question, no. I think. however, there may be some negative spinoffs even if they do not construct the canal. Apparently the Chinese have got their feet in the door for development on Ometepe Island as well as in the region where the canal would drop down to the Pacific from Lago Nicaragua. These agreements were part of the package agreement for construction of the canal. Apparently these agreements would continue in force even if construction of the canal does not take place. A local bank manager is a Venezuelan. His wife is from Nicaragua . And of course the Panama region is much more stable? The nearest active volcano to the Panama Canal (PC) is Volcán Barú some 307 km distant. Terrible earthquakes have hit Managua on the shore of Lago Managua which is close to Lago Nicaragua. The original site of Leon was completely destroyed by a series of earthquakes related to an eruption of Volcan Momotombo, also located on the shore of Lago Managua. Leon was relocated to a site about 30 km west of the original site. Momotombo is quit active at the moment. Construction in many of these areas does not reflect the frequency of earthquakes. But many of the people are very poor and have little choice but to continue living as they have. Conclusion, life in these areas is not what one would call very safe -geologically speaking. This project is indented to me hol very close to liquid magma, but at dept soit can be controlled. GL Edit: Tweaked your link to the direct image link. No biggie. Geonet have blogged about it; a routine tectonic swarm very common in that area. Eyewitness to the Laschamp event? And a wild arsed theory. I think it is possible that the event was caused by eddy currents following a detachment event of a shard from the recently (geologically recent) subducted Tethys sea oceanic crust. A lot of large caldera events sprang up along the Italian peninsula around this time. A moving conducting fluid, such as magma, can affect the local magnetic field. Turbidity in the athenosphere fits the bill in my reasoning, though there should have been a similar geomagnetic excursion during the columbia flood basalt event of 20+ myr ago and I haven’t seen any data on one being recorded for that time frame. Just a freak idea to mull over on a Sunday afternoon. Enjoy! Contemporary of Shackleton I think. Activity in Askja seems to be picking up. Worth keeping an eye on. Australian team looking for missing Malaysia Airlines flight MH370 locates 2,200 foot tall mud Volcano. New post is up. The missing volcano of 1809. Yes, comments are closed for some reason. I poked around a bit but was unsuccessful. I have to do a drive and it will probably have to wait until Hobbes is available. Yep, gonna take more than my feeble mind to figure it out. New post by Albert is up! Are the Upper and Lower Rhine Grabens and the volcanic Eifel plateau good locations for the exploitation of geothermal energy? I think that there must be a high heat flow in these places.